FILE - Residents look at an Army vehicle that was damaged during battle between Afghan security forces and Taliban in Farah province, Afghanistan, May 16, 2018. The Taliban have since agreed to a unilateral cease-fire from the Afghan government. "It is even possible the talks to be held with Americans, Afghanistan [the Afghan government] and Taliban. 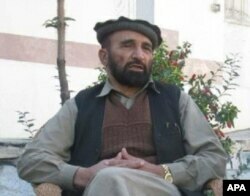 It is much easier than shed blood in the battlefield, kill and spread hatred," Mullah Abdul Salam Zaeef, Taliban's former ambassador to Pakistan, told VOA. 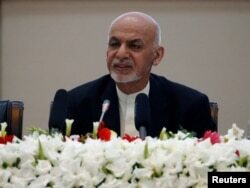 "The people of Afghanistan should take advantage of the opportunity and talk to both sides to extend the cease-fire for three months, it is our and people's wish," he added. FILE - Afghan President Ashraf Ghani speaks during during a peace and security cooperation conference in Kabul, Afghanistan, Feb. 28, 2018. "We are hopeful that this historical move ensues direct, Afghan-owned and -led peace talks," Sayed Ehsan Taheri, spokesperson for the council, told VOA. "We welcome the Taliban response and [are] looking forward to seeing it turned into opportunities for lasting peace in Afghanistan," Shah Hussain Murtazawi, a spokesperson for Afghan President Ghani, told VOA. The Taliban, which announced their cease-fire after the Afghan government, would not say if it was a direct response to the Afghan government's action. "We have been stopping fighting during the Eid days, but we would not announce it publicly due to security reasons," Mujahid said. The first-ever cease-fire by Taliban can be considered "exceptional," experts argue. "Maybe Taliban stopped fighting during the Eid days in the past, however, this time around, the cease-fire is exceptional. We are very hopeful that warring parties use this period to extend the cease-fire," Khalil Roman, a Kabul-based political expert, told VOA. Mohammad Jawad Rahimi, a California-based Afghan analyst, is giving the credit of the cease-fire to what he calls "a systemic change and a very strategic action by the Afghan leaders." "This absolutely can lead to a longer term for peace and it also opens the doors for negotiations and talks between the Afghan and Taliban leaders. However, for this to work, we have to have national and international support," Rahimi said. "I am positive that Afghan-led peace process will lead to a very successful and peaceful future of the Afghan people, which we have been waiting for for decades." "The United Nations maintains that there can be no military solution to the conflict in Afghanistan, and welcomes these cease-fires as positive developments toward reducing the violence in Afghanistan and ending the war," said Tadamichi Yamamoto, the U.N. Secretary-General's Special Representative for Afghanistan and head of UNAMA. "We will not resort to any kind of firefight against Taliban from 27 of Ramadan until the fifth day of Eid. But our operations will normally be continued against Islamic State and al-Qaida," General Mohammad Radmanish, spokesperson for the Afghan defense minister, told VOA. "We will adhere to the wishes of Afghanistan for the country to enjoy a peaceful end to the Islamic holy month of Ramadan, and support the search for an end to the conflict," Nicholson said.